It's that time of year again. Moms everywhere are scrambling to come up with cute Valentines for their kids to deliver to all their little friends. As one of those moms, let me just go ahead and say that I shocked myself by getting these completed in time not only to take to preschool next week, but also to post on the blog. I'm never this ahead of the game. Aren't these the cutest little rings? Last week I was wandering through Target sans kiddos (a rare treat in itself) when I saw these colorful eraser rings in the Valentine section. I knew they would be perfect for Micah to take to preschool, so I whipped up a sweet little tag for her to sign on the back before attaching them to the rings. She also has to take some Valentines to church for a grandparents' brunch, so I created some cards that she can sign on the bottom without attaching the rings. If you can't find eraser rings, these Valentines would also work well with ring pops or play jewelry. You can cut out the hearts from the cards as we did, or you can pop the rings in little bags and attach the full-sized cards. If you're anything like me, you're all about options. I hope you enjoy these little gems. 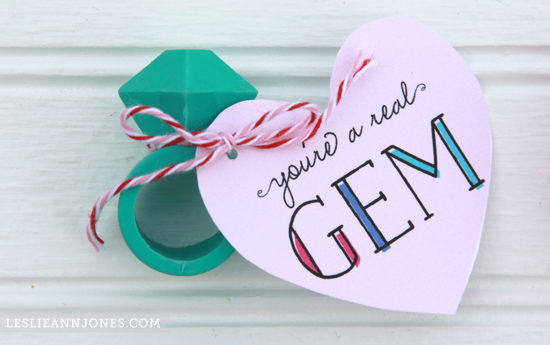 Download your free printable You're a Real Gem Valentines here. Hope your little one loves them as much as mine! THE SMALL PRINT: You may not accept credit for the design of this card or sell it to anyone. Leslie Ann Jones retains the copyright. If you wish to share the digital file with others, please direct them to this post. Do not e-mail the file all over the world. Please don’t link directly to the download file. 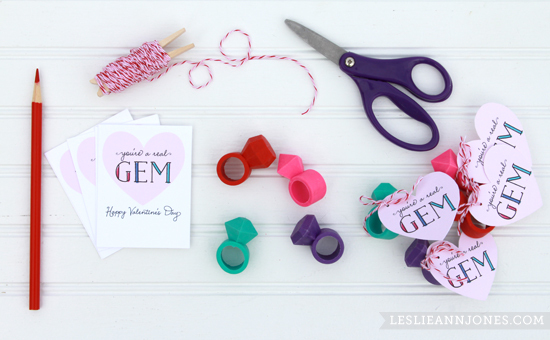 Click to download your Free Printable You're a Gem Valentines! You can see my entire collection of free printables, including these Love Bug Smarties Valentines in the freebies section. Happy printing!